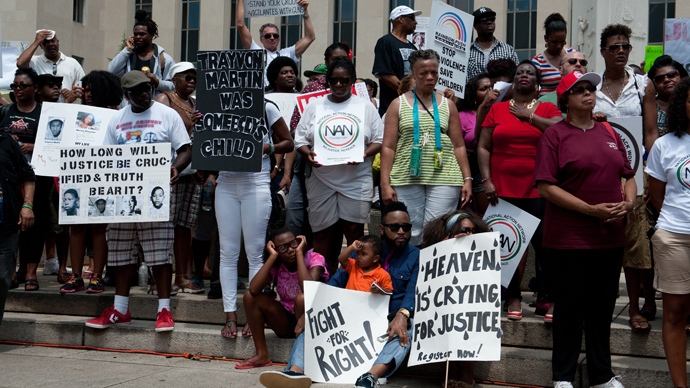 Thousands took to streets across the US on Sunday, as protests against the acquittal of George Zimmerman entered their second day. Zimmerman, a former neighborhood watch volunteer, shot and killed 17-year-old Trayvon Martin in 2012. Follow RT's LIVE UPDATES on Zimmerman verdict fallout. The Justice Department said Sunday that it will restart its investigation into last year’s killing to consider possible separate hate crime charges against George Zimmerman. The news follows huge public outcry and calls from civil rights leaders to reopen the inquiry. "Experienced federal prosecutors will determine whether the evidence reveals a prosecutable violation of any of the limited federal criminal civil rights statutes within our jurisdiction...and whether federal prosecution is appropriate in accordance with the department's policy governing successive federal prosecution following a state trial,” a Justice Department spokesman said in a Sunday statement. 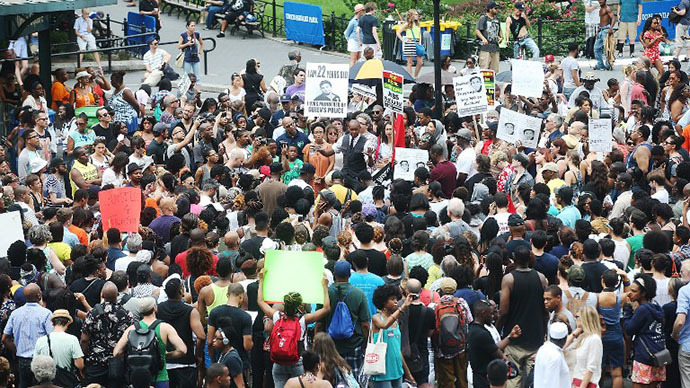 Massive “Justice for Trayvon” marches took place in New York City, Boston, San, Francisco, Los Angeles and other cities across America on Sunday. At least five people were arrested in New York, RT’s Marina Portnaya reported. US President Barack Obama has called for peaceful reaction, urging Americans to respect the verdict of the jury, which cleared George Zimmerman of the murder of Trayvon Martin. “I know this case has elicited strong passions. And in the wake of the verdict, I know those passions may be running even higher. But we are a nation of laws, and a jury has spoken,” the president said in a statement. 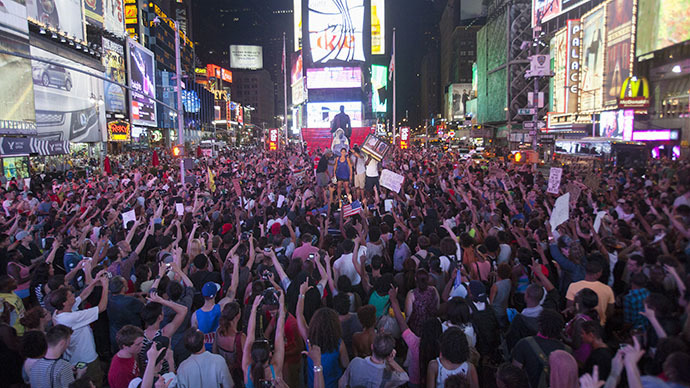 In New York City, a few thousand people marched from Union Square to Times Square. Demonstrators blocked traffic while chanting slogans. Police tried and failed to funnel the crowd into controlled lanes. Some 500 protesters of different ethnic backgrounds took to the streets of Boston, with police describing the rally as "very orderly." "Morally it cannot be right, that a child cannot go about his business and go to the store," 57-year-old Maura Twomey told Reuters. "Racism is not just an issue for the black community. It's for all of us." Hundreds protested in San Francisco and Los Angeles, with RT’s Ramon Galindo reporting that demonstrators shut down the I-10 interstate highway. On Saturday, large spontaneous demonstrations broke out after the jury announced the not-guilty verdict. Demonstrators in Oakland, California smashed windows in protest. There were also reports that small fires burned throughout the city, and that a police vehicle was damaged. Twenty-nine-year-old Zimmerman was acquitted on Saturday of all charges relating to the fatal shooting of Martin. The former neighborhood watch volunteer could have been sentenced to life in prison for second-degree murder or up to 30 years for manslaughter if he was found guilty. Martin, 17, was shot over a year ago by Zimmerman, who claimed he acted in self-defense. 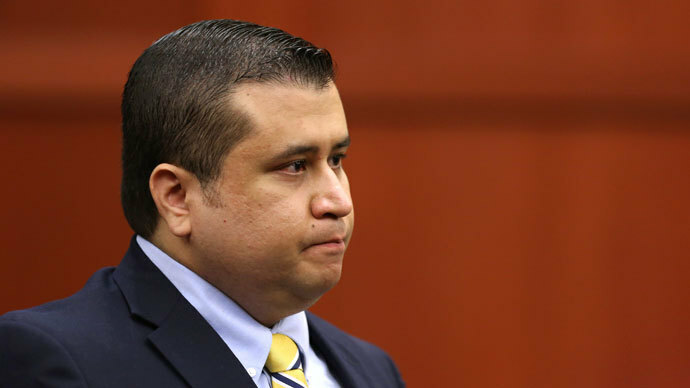 The prosecution argued that Zimmerman was guilty of second-degree murder, stating that he racially profiled the unarmed teen and assumed he was a criminal when he saw him walking through a gated community in Sanford. They claimed that Zimmerman tracked the boy down and started the fight that led to the shooting.